During the course of a single week, three cougars were killed at a family ranch in northern Washington. 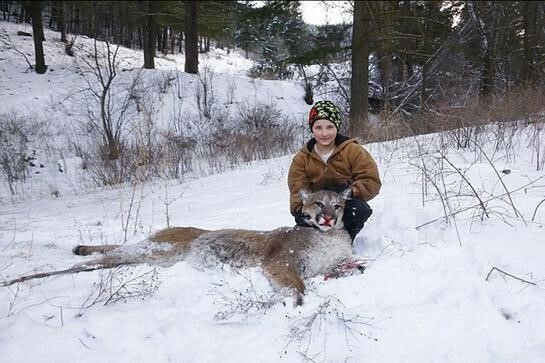 The latest big cat was killed by 11-year-old Shelby White, who shot an emaciated lion that had been stalking her older brother near their home. Thomas White awoke at 2:30 a.m. to the barking of the family dog so White walked outside and discovered a cougar trying to enter an enclosure of cows and calves. Although he scared away the cougar without incident, the lion returned two hours later and White drove it off a second time. Later that day White’s three children arrived home from school at 3:30 p.m. The cougar turned up a third time when his 14-year-old son Tanner White was doing his chores outside. Tanner had finished feeding the dogs and was walking back toward the house when the cougar emerged from its hiding spot by a vehicle in the driveway. Tanner didn’t notice the cat following him and walked safely through the basement door. His dad was in there and said, ‘Close the door!’ because there was the cougar, right behind him. 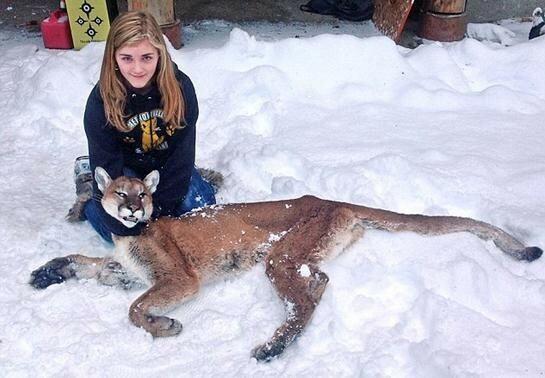 Shelby White, 11, was the only member of the White family with an unfilled cougar tag. She retrieved her rifle and shot the cat where it stood outside, just 10 feet from the door. The 4-year-old female cougar appeared “very, very skinny” and weighed just 50 pounds. A healthy mature female cougar should weigh twice that, according to Treser. “It was starving to death,” Treser said. Shelby’s cougar was the third big cat taken on or near the family ranch in a single week. Two days prior a family friend tracked a cougar within 200 yards of the ranch. The hunter shot the 2- to 3-year-old female cat near the White’s driveway a couple days earlier. The youngest White child also tracked and tagged a cougar on the property. Nine-year-old Cody White and his father spotted paw prints near the White house and followed them to the family’s calving pasture. He discovered a 120-pound male cougar and shot it on the hillside. Additional tracks and big cat sightings have occurred in the region since and a total of 10 cougars have been harvested during the season. Five were taken by hunters and the other five were killed by wildlife officials after the cats attacked domestic animals. The number of cougar predations and encounters in the area is above average. Wildlife officials suspect cougar numbers have increased or the big cats cannot find enough deer to survive without resorting to domestic prey.